Which of the following do you associate with Yosemite National Park? Surprised? Its reputation as one of the most scenic places to visit with its awe-inspiring granite monoliths-and one of the most challenging for rugged outdoor enthusiasts-is only one side of Yosemite. Few realize that this national park has all the luxuries and amenities of a first-class resort within and around the park vicinity. Now, 1,170 square miles of national park is a lot to cover, and although I have visited a half a dozen times, I’ve barely scratched the surface. Our experiences in Yosemite prior to this year had been limited to camping and hiking. On our last two trips, we discovered the wide variety of accommodations and activities available. No matter the age or interests, there is bound to be something to engage every member of your family. On our most recent trek, we decided to split up since my husband Robert had been wanting to take our 12-year old son Adam hiking to the top of Half Dome , the landmark granite peak which looks like half of a giant melted ice-cream scoop. It is one of the most demanding and popular day hikes in Yosemite-or the state of California for that matter-a true test of fitness, stamina and will. Meanwhile, my 5-year old daughter Zoe and I took the leisurely pace, and there was plenty to do. We toured around the valley trails on a rental bike, stopping by riverbanks, and visiting stables. We then browsed the gift shop, went swimming in the pool, showered and had dinner on the café deck in Curry Village . After dark, we kept ourselves from fretting over their safety by watching the evening program in the outdoor auditorium. The boys had a late morning start. And soon it became obvious by the afternoon they had detoured from their last-minute plan- to turn back at noon wherever they happened to be. Knowing Adam’s driven nature, I figured they’d gotten so close to the top that he didn’t want to return before reaching the goal. I had guessed correctly. 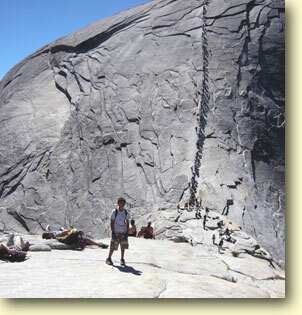 It was so crowded on the Half Dome hike they had to wait one hour in line to climb the cables the last 100 yards up the rock face. Fortunately, they arrived back at about 9:00 p.m. While I wouldn’t say I enjoyed worrying, Zoe and I definitely got the easier end of the deal. 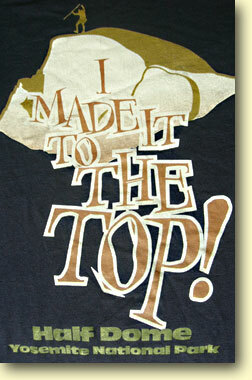 But then they gained the bragging rights of attaining a pinnacle of achievement. Yosemite fits families with budgets of all shapes and sizes. Here's what you can expect to pay on your next trip. Wilderness Permits - Wilderness permits are free but there is a $5/person charge for reservations for overnight stays in the wilderness. Film & Wedding Permits - Special use permits are required for weddings and commercial filming and photography. $18.00/night for campground reservations; tent cabins staring at approx. $65.00/night; lodge and hotel rooms starting at $100.00. There are plenty of places to lodge, but some accommodations are closed in winter. Check online for seasonal rates and in-park availability, as well as campgrounds and hotels just outside park boundaries. Prices range from $65.00/night for tent cabins to $850.00/night for the best suite at the luxurious 4-diamond Ahwanee Hotel , a National Historical Landmark. You can reserve camp space ahead of time or walk in for traditional tent camping or stay in RV campgrounds throughout the park, including Yosemite Valley and Tuolomne Meadows. Wilderness camping in the high country is allowed with a free permit on a first come, first served basis. You can reserve $65-per-night tent cabins in the valley and high country, but don't expect to have a cookout. Due to potential blazes, tent dwellers in Camp Curry cannot cook or set up campfires. The tent cabins in Tuolomne Meadows have central dining rooms. The hike-to High Sierra Camps include full dinner and breakfast. I’ve only listed these two choices as they fulfill two categories, respectively, historic interest/luxury and nearest proximity to park from Bay Area. You can find other options using the Noteworthy Websites below. • Wide variety of restaurants and food courts in Yosemite Village and Curry Village. • Gourmet dining at the Ahwanee restaurant & bar, breakfast, lunch & dinner. • Dining rooms at Tuolomne Meadows Lodge and Wawona Hotel. • Restaurants at Yosemite Lodge. • We couldn’t easily find a restaurant for those not lodging in Tuolomne Meadows, but we did find a small café with limited seating a few miles outside the east entrance. • Outstanding cuisine and award-winning wine list at Groveland Hotel. • Best authentic barbeque in an outdoor rustic setting in Groveland, tucked behind a parking lot near Groveland Hotel. Follow signs next to service station. Evening might be the best time to avoid nuisance of yellow jackets. As Smoky the Bear says, when leaving the forest "Take nothing but pictures, and leave nothing but footsteps." • Take first exit off I-5, marked "Sonora, Highway 120"
Visitors can ride Yosemite's YARTS buses from gateway communities outside the park into Yosemite Valley. Buses connect with Amtrak and Greyhound in Merced. • Refer to Yosemite’s calendar of events and programs. There is a schedule online, and a printed copy you will receive along with map when you pay for park entry. • Give young ones a whistle they can blow if they get lost. Make a card they can carry with hotel/camp information and phone numbers. • Have a where and when plan to meet if separated. • Check what you need to bring for lodging. Some tent cabins provide linens while others do not. • Plan for layered clothing. Nights and mornings can be chilly even in summer in Yosemite Valley. Weather is usually noticeably cooler moving from the valley to higher elevations. • Make guessing games as you sight-see. Our favorite: How many kitchens could you make countertops for, from all the granite in Yosemite? • If you are in shape for the long strenuous hike up Half Dome, leave early in the morning, planning on 10-14 hours to get to the top and back. You can hike from where you are staying, or take the shuttle bus to the trailhead at Happy Isles. Bring food, flashlight/headlamp and more than enough water. The shuttle runs in the evenings most of the year, so you can give your tired dogs a rest before strutting back to camp. • Arrive at bike rental facility by 10:30 a.m. if you want to rent, or you may spend a lot of time waiting for people to bring back rentals. • Reserve popular activities or dinner spots in advance. www.yosemitepark.com : Park information, calendar and online bookings. www.yosemite.com : Great trip planning resource. www.badgerpass.com: Winter activities at Yosemite. www.nps.gov/yose/trip/camping.htm/ : Information on campgrounds. Campground reservations, 7am-7pm, Pacific Time. www.tenayalodge.com :Tenaya Lodge at Yosemite. www.parks.ca.gov : Mono Lake Area. www.bodie.com : Bodie State Historic Park. Bev Manzano is a contract art director and writer who lives in Sunnyvale with her husband Robert and their two children, Adam and Zoe. They continue to chip away at the million things to see and do at Yosemite-and abroad-in between keeping up with numerous fascinating hobbies, volunteerings, and of course, work.